Climate reconstructing; it sounds elusive. Climate, that’s weather averaged out over a period of 30 years. But weather is so evanescent! The wind, sunshine, rainfall we experience one day; how much is left of that the next day? Let alone 30 years later. Climate reconstruction therefore has to rely on indirect measures. You want to know how windy it was at a given place, over a period of time? Find a place where wind-blown dust would accumulate, and measure its grain size through time. It evidently takes stronger winds to transport larger grains. And you have to be careful that you’re not looking at a record of dust availability, but if you’ve ruled that out, you may have managed to reconstruct the elusive wind. Trying to reconstruct sunlight? You might manage to find pollen of various species of plants; some that need more sunlight than others. Rainfall? Try to find a dripstone cave; the stalagmites in it are likely to have recorded that in their isotopic signature. Big icebergs that have calved from a glacier are easy to trace. During their time as a part of the glacier, they pick up material of all kinds – from clay to boulders. And while they melt, they deposit that on the sea floor as so-called ice rafted debris. An iceberg will float into the open sea, where rivers can’t reach, rather soon, so if you find coarse sediment in a region like that, you know who the culprit must have been. But these icebergs are not the big player in the climate system; that’s the sea ice that froze straight from the sea water. That covers the big expanses of the polar oceans, and reflects all of that light back into space. How to get a handle on that? 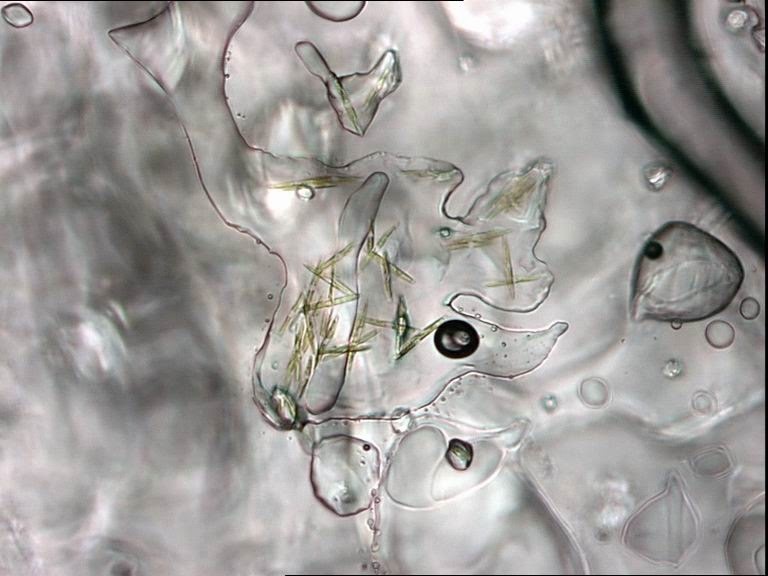 Later on, people figured out that something quite relevant lives attached to the (thinner) sea ice: sea ice algae. And they contain biological compound, which they called IP25, and which is not found anywhere else, and which is very resistant to degradation. 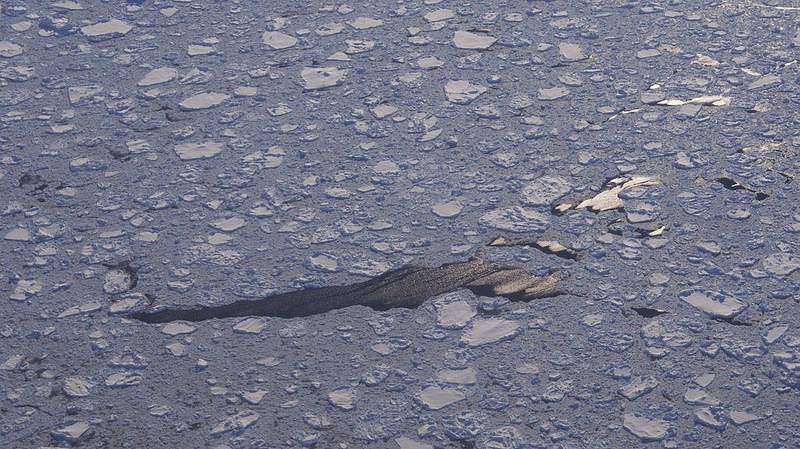 Find this in your sediment, and know for sure there has been sea ice overhead. This kicked sea ice reconstruction into a higher gear. Never before had something measurable in sediment been so unequivocally linked to the presence of sea ice! Drill a transect of cores, date them, measure this organic compound through the cores and you know how far the ice has reached over the time period covered by the sediments in your core (provided you chose your transect wisely). So have we finally found a method of environmental reconstruction without caveats? Well no, of course not. First of all, if you don’t find this compound it doesn’t necessarily mean there was no sea ice; it might just have been so thick it didn’t let any light through, so the algae couldn’t live under it. And another issue is: when do you consider an area of sea covered by ice? If it’s entirely covered? When it’s mostly covered? What are you really reconstructing when you find this IP25? 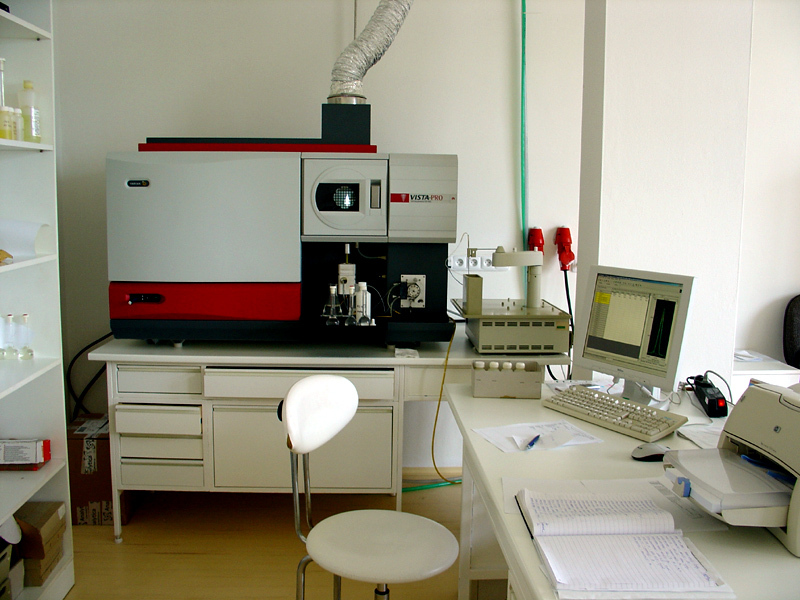 Microfossils: for the 19th or 21st century? Microfossils: the word alone is enough to send many people to sleep. Who would study them? Aren’t these today what they were in the 19th century: a nice eccentric hobby for rich men with lots of time on their hands? And of no practical use? 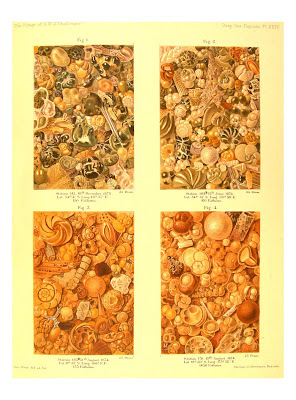 A page from one of the reports from the Challenger expedition (1872-76), depicting sea floor sediments which contain many foraminifera. The report on foraminifera is still used as reference material; as recent as in 1994, another edition was published. Microfossils have taught us much of what we know about the world we live in and how it changes. Consider, for instance, an archaeological excavation, and how pollen tell us of the vegetation at the time the site was occupied. But microfossils can do much more: an example that can illustrate the amazing amounts of information they contain is provided by foraminifera. 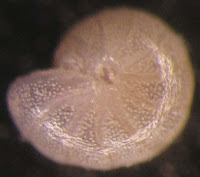 Foraminifera are a group of unicellular organisms that live in the sea. 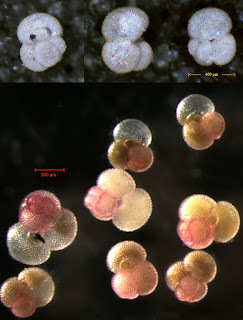 Some species live floating around in the water column (planktonic foraminifera) and some live on or in the sediments on the sea floor (benthic foraminifera). They build exoskeletons (also called tests or shells), made of either calcite or material they find around (a bit like some fly larvae; some have been coerced into making their protection from gold; see pictures here). Their name means “Bearers of holes”, as their calcite skeleton tends to show pores. They are found almost everywhere in the world ocean. 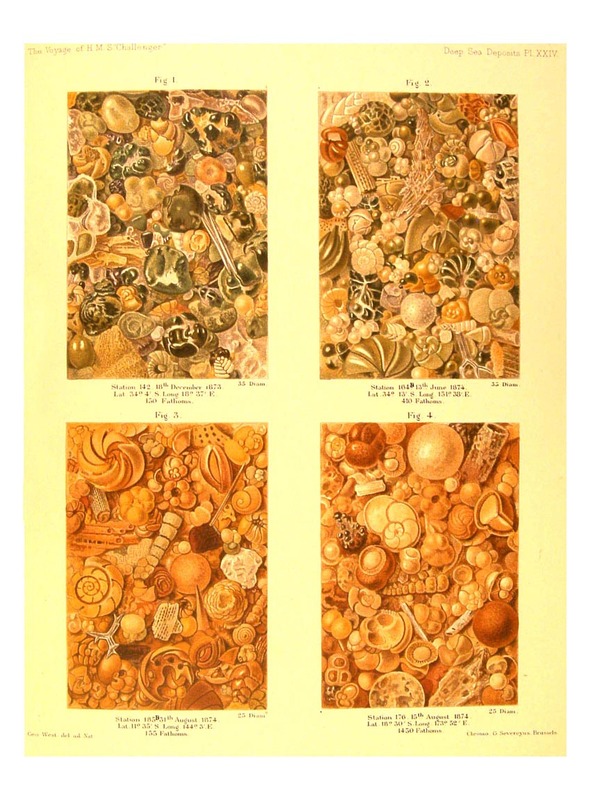 There are thousands of species of foraminifera, and they all have their own living preferences. 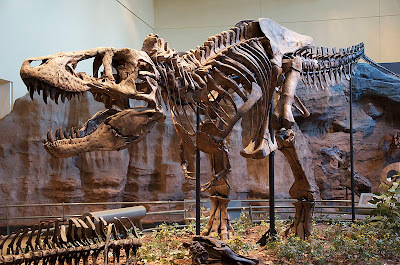 When they die, their bodies decay rapidly, but their skeletons can be preserved for hundreds of millions of years. And the physical and chemical composition of the (calcitic) tests reflects the sea water they were formed in. So if you stick a core into the sediments on the sea floor, you’ll have a column of little measuring devices in neat chronological order. So how do these tiny snail-like things record anything? The distribution of the various species already provides a wealth of information. If from the bottom of the core up you first find cold water species, and then increasing numbers of warm water species, most of which first being those that prefer fresh organic material as food, and then later species who don’t mind their food having gone off massively, you already know quite something about the changes that happened where you took your core. And some species have very convenient properties: for example, Globigerinoides ruber generally forms a bog-standard white calcitic tests, but in warm water (>~25°C) it can make pink ones too. And Neogloboquadrina pachyderma can coil in two directions; in water between freezing point and ~5°C it coils almost exclusively anticlockwise, and above ~10°C it coils largely clockwise. So one glance through the microscope can sometimes tell you the approximate temperature of the sea water the creatures lived in. The amount of information you can tap into increases greatly if you study the calcite the tests are made of. The oxygen in the CaCO3 provides a lot of clues: Oxygen has several stable isotopes, of which the most common is 16O at ~99.7% of all oxygen on Earth. Another stable oxygen isotope that is often used in palaeoclimate studies is 18O. These isotopes have slightly different physical properties. As 18O is heavier, water molecules containing it tend to evaporate from liquid water with a bit more difficulty, and when they do, they rain out of the atmosphere a little bit easier. It also leads to 16O preferentially evaporating from the ocean and precipitating on the continents, which means the high latitude ice sheets are relatively enriched in 16O. Measuring the 18O/16O (δ18O) ratio in a series of foraminifera that span hundreds of thousands of years will thus reveal the familiar see-saw pattern of glacials and interglacials, which is also found in the CO2 and Deuterium records from ice cores. In this indirect way, 18O can be used to date records based on foraminifera tests. Some glacial-interglacial cycles. 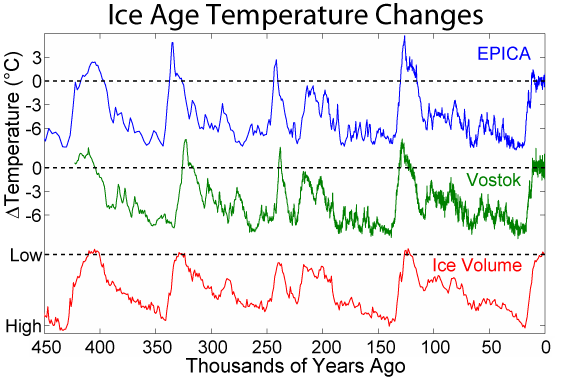 The Epica and Vostok graphs show temperature reconstructions based on Deuterium measurements from two ice cores, and the bottom graph is a reconstruction of global ice volume based on 18O records of benthic foraminifera. Vostok record from Petit et al., Nature 1999. Epica record: EPICA project members, Nature 2004. Ice volume record: Lisiecki and Raymo, Paleoceanography 2005. More information is stored in the chemical composition of the calcite; it does not consist of pure CaCO3, as some of the Ca2+ atoms are replaced by other bivalent cations, such as Mg2+ atoms. As incorporating atoms of the “wrong” size in a crystal lattice requires extra energy, this occurs relatively often in warm environments, due to the ample availability of thermal energy. The ratio of Mg to Ca in a calcitic shell therefore is a measure for past sea water temperatures. 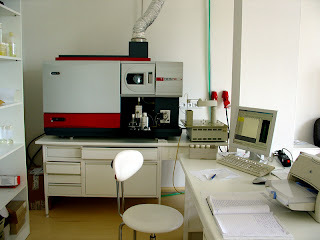 These measurements can be performed on many tests at the same time; this will provide a measure of average conditions. They can also be measured individually, which gives information about only the lifespan of the individual organism. And it is even possible to blast the tests with laser beams, and measure the CaCO3 that then evaporates. (A nice picture and explanation can be found here.) That will give the evolution of the temperature of the water the creature has lived in through the course of its life. Given how specific one can target what to measure, a wide range of oceanic conditions can be reconstructed. For instance, a researcher who wants to reconstruct the stratification of the ocean could measure the properties of the tests of a shallow dwelling species and a deeper living species. When the signals resemble each other, the water masses were thoroughly mixed. Large differences point to well-developed stratification. 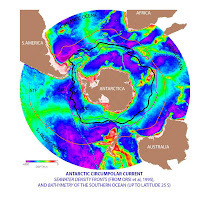 You want to know how strong the circumpolar current, which flows all around Antarctica, and keeps the continent thermally insulated, has been through time? Drill a core where it currently flows, one core at its furthest reach, and one core just outside it reach. 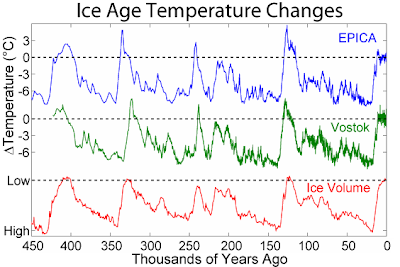 And then check the amount of polar and temperate species in all three through time. Do you want to know how strong the Gulf Stream was? This current brings warm, salty water to the North Atlantic, where it cools down, and sinks to the bottom. Drill a core somewhere in its path, and check the temperatures as documented in both the surface-dwelling and bottom-dwelling foraminifera. If the difference is large, the Gulf Stream was likely strong. Do you want to know how strong the Indian monsoon has been through time? The summer and winter monsoon seasons both have a cooling effect on the sea surface temperatures; the stronger the monsoon, the colder the sea water gets. And each monsoon season has its own distinctive foraminifera assemblages, so these temperatures can be reconstructed independently. If you measure single specimens, you will also catch the few individuals that live in the very warm water between the monsoon seasons. All of these examples of course come with their caveats. The reconstructions you can make of these features are not perfect, but if you corroborate them with other measurements you can paint a very detailed picture of how countless many aspects of how the world works. And if you know what it does, you may be able to find out why it does it, and that may tell you what to expect for the future. 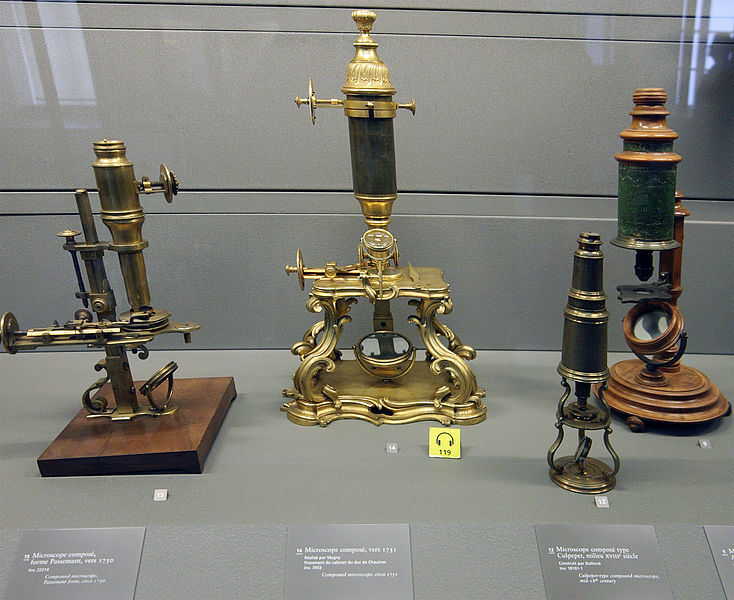 So even though staring down a microscope staring at small things that look a bit like miniature cauliflower might feel very 19th century, it might actually be part of cutting-edge modern research! Ask a person to name a mass extinction event, and chances are very high they’ll come up with the event that eradicated the dinosaurs. Whether the cause was a meteorite impact or not; 65 million years ago, in what is commonly known as the K-T event, a large group of charismatic megafauna vanished. 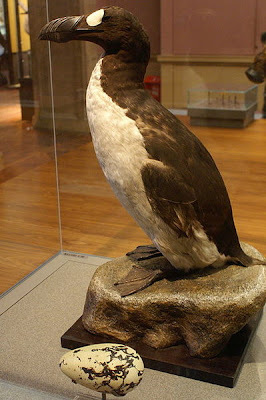 And not just them; an estimated 76% of species (at maximum) got extinct. And that number earns it a place among the “Big Five” extinction events. 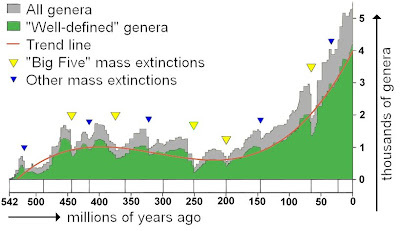 The K-T event is the most high-profile mass extinction event, but is it also the biggest? The most relevant? The first it certainly isn’t: that honour befalls what’s often called the late Permian ent, which happened ~250 million years ago. No less than 90-95% of species is estimated to have gone extinct. Why? Nobody knows for sure, but many fingers point at epic scale volcanism in Siberia. 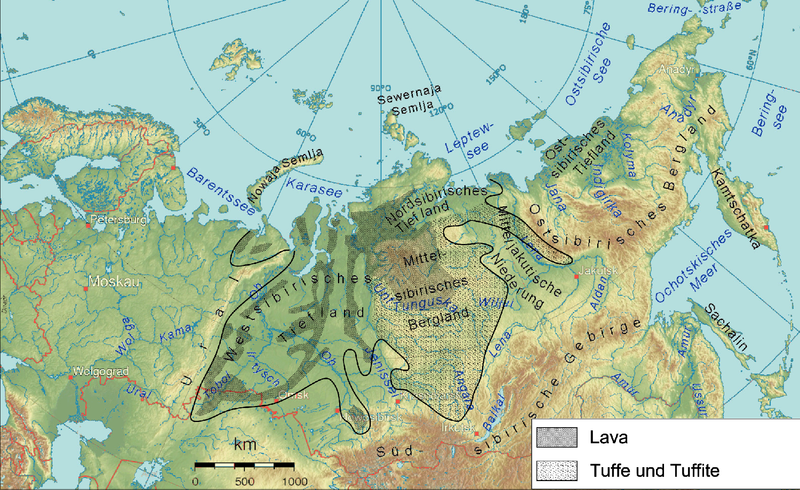 Fissure eruptions, so big the lavas covered an area the size of Europe, spit out large amounts of greenhouse gases, raising global temperatures. Then add continental weathering, melting of gas hydrates, nutrients ending up in the ocean, ocean warming, and reduced ocean circulation, and you have a maelstrom of interconnected environmental disasters, and, le voila: a mass extinction. So does that mean the late Permian extinction even is the most relevant? That question isn’t really answerable. But I offer another candidate. What about the 6th big one? Look out of the window. Right there, an extinction event is taking place. Think of the dodo, the great auk, the Tasmanian tiger, the golden toad, the quagga, the Cape lion. And for every species of charismatic megafauna there are numerous more obscure species that have vanished, many of which have never even been festooned with a common name. Spare a thought for the Lake Pedder earthworm, the American Chestnut Moth, Blackburns weevil, the Passenger Pigeon and its companion, the Passenger Pigeon Mite; the Hawaii Chaff Flower, the arcuate pearly mussel, the Rubious Cave Amphipod… Only in hindsight will we know if this is the start of a mass extinction event. Comparing modern extinction rates with fossil ones is fraught with difficulty. In the fossil record, you need to fossilise to stand and be counted. Hence the name, indeed. Nobody really knows how many non-fossilising species there have been. And we don’t know how many species there are today. How many have already gone extinct before ever having been discovered? And of many species that have been described, we don’t really know if they are still there or not. And then, of course, it’s not just the rate that counts; it’s also the duration of the event. And if you would assume that sufficient knowledge on taxonomy to be able to say anything useful about extinction rates starts with Linnaeus, that leaves us with less than 300 years of data. We do know that the rate of extinctions we experience now is estimated to be several orders of magnitude higher than the background extinction rate. And we know that if we go on like this, we’ll have made ourselves our very own mass extinction event in a few centuries to a few thousand years. If things get worse we might manage in even less time. Which would make it the fastest mass extinction event in the Earth’s history. Behold man, truly the master of creation! For my job I spend quite some time staring down the ocular of a microscope. After getting an MSc in geology I have worked in science for over 10 years now; I have studied monsoon evolution on timescales of tens of thousands of years. I have studied the changes in the microfauna of the Barents Sea due to global warming. And nowadays I study sea level changes. 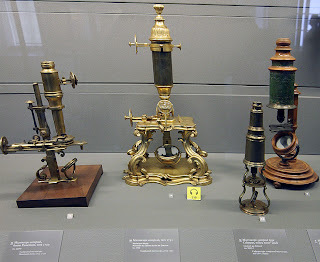 All using a microscope. My findings have been ending up in peer-reviewed journals, which are notoriously expensive to get access to. I therefore have also been venting my scientific spleen on my personal blog, but I decided I want to have an online platform specifically for my scientific views. I have reversed the ocular; the lens that focusses the beam of light in one direction will let it radiate out in the opposite direction. Does the world need yet another scientific blog? One way to find out. Welcome.